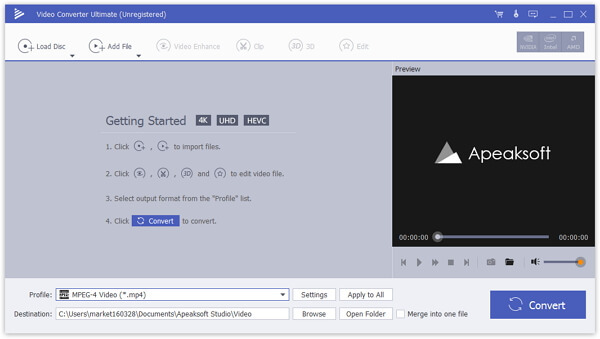 Apeaksoft Video Converter Ultimate 1.0.6 Free Download - Convert video to all popular video formats and download video. Apeaksoft Video Converter Ultimate helps convert any video to other formats like MP4, MOV, AVI and more so that you can enjoy your videos on more devices. In addition, it is available to download your favorite videos even 4K videos from YouTube, Yahoo, Vimeo and other hot video site. Before your conversion, you could edit video effects. And the new added enhancement enables you to enhance video by optimizing brightness and contrast, upsacling video resolution, removing video noise etc. Video Converter Ultimate enables you to open DVD videos or folders, and lets you edit and convert homemade DVD videos with ease. You can convert homemade DVD to video in MP4, AVI, WMV, 3GP, FLV and other formats and 3D video files with simple clicks. Statement: First, please download the orginal installation package by clicking the download link. Of course you may also download it from the publisher's website. Using Apeaksoft Video Converter Ultimate crack, key, patch, serial number, registration code, keygen is illegal. The download file hosted at publisher website. We do not provide any download link points to Rapidshare, Hotfile, Depositfiles, Mediafire, Filefactory, etc. or obtained from file sharing programs such as Limewire, Kazaa, Imesh, Ares, BearShare, BitTorrent, WinMX etc. Software piracy is theft. If you like Apeaksoft Video Converter Ultimate please buy it.